This level has hard difficulty and you need to use good trick to complete this level. 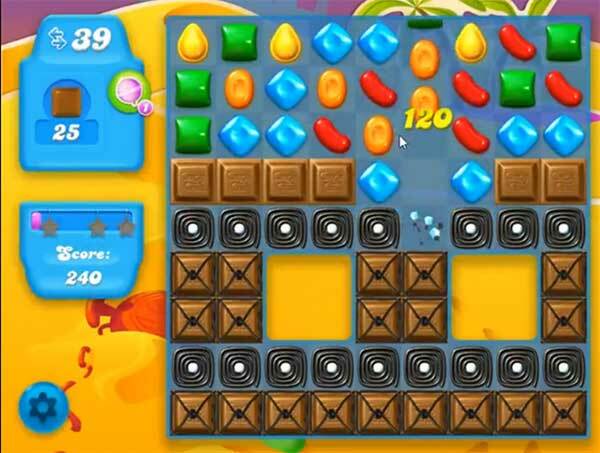 For this level you should try to play from bottom of the board to break the chocolates and as you have more candies to play then try to make striped candy or wrapped candy combo with colorbomb to break more blockers, grills and chocolates. After try to play near to remaining chocolates so they won’t increase and will help to reach the target within 40 moves. I have known for quite a while that candy crush saga and soda is a greedy and selfish game company that just wants to make money. No matter how good of a player you are the board they give you will not let you win even after using multiple boosters. I was stuck on this level for over 6 months. I refused to buy gold bars. Every now and then I would try to pass the level. I think after awhile the game creators know I won’t buy gold bars and then they make it easy to win. I had so many extra helps in the game that I finally one. So glad to be off that level. I hate the chocolate levels.